Please share your memories and stories about your favorite New Line shows, by adding your comments to the shows below. Thank you for celebrating with us the joy of making adventurous, adult musical theatre. It is 1968 and the youth of America are lost. Their parents, still celebrating the prosperity that followed World War II, have raised social drinking to an art form, they are bathing in the excesses of capitalistic materialism, and they are showering their children with everything anyone could want – except the nourishment of the soul. These young people have all the physical trappings of happiness but don’t know who they are, where they belong, what is expected of them. More of them are going to college than ever before, where they learn to think independently, to question the status quo, and to reject their parents’ long-held, arbitrary definitions of morality, success, and happiness. These young people see racism run rampant in America, with lynchings still common in the South. They see American youths shipped off to southeast Asia to fight a war which has nothing to do with America and which appears to be unjust, immoral, racist, and impossible to win. They see disregard for the environment in the unchecked progress of American industry. And they see a culture that now worships at the feet of a new God – consumerism. What do these kids want? They want to erase all the rules and start over, creating a new society that makes sense, one built on the idea of celebrating all the wonderful, magical, indefinable things that make us human, the things that unite us, the things that join us to the rest of the natural world. They ask why we have such restrictive rules of sexuality. Is it because some long ago culture wanted to control inheritance? Or was it about the perpetuating of a particular ethnic group? Why do we have such restrictive rules about drugs? Is it because once we taste the liberation of mind-expanding substances, we’ll be harder to control? Why do the adults who drink like fishes at cocktail parties so self-righteously condemn marijuana? Why do they so strongly condemn all drugs, when so many other cultures highly value the ritual use of hallucinogenic drugs to achieve a higher level of consciousness and to find God? Why do so many people call themselves people of faith but act in such immoral ways? We have come to ask you to join us in rejecting violence, hatred, fear, and judgment wherever we find it, to question the way things have always been, to look at the world with fresh eyes and to resolve to change the things that need changing. It is a new age. Everything is ready. It’s time to change the world. After my first show with New Line, Anyone Can Whistle, I took a psychedelic trip up the Methedrine River to Hair. I could not believe that I got to do this show. I wanted to do this show ever since I was in college. I said that if anyone ever did it, I would be in it. 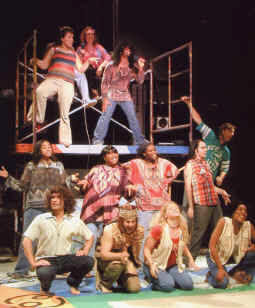 Well, a year before doing Whistle, I was skimming through the Riverfront Times and found that New Line Theatre was having auditions for Hair. I thought the mother ship had landed and it was calling me home. But I was not prepared for the audition at all, so I didn't go. Later during the run of Whistle, some of the last year’s Hair cast come to see us. I was so nervous because they didn't know anything about me; I didn't know anything about them; I just didn't know what to expect. When I met them, they were so friendly and welcoming of me, I knew everything was going to be all right. I will have to keep it real – I was a little overwhelmed by the words in the songs, but everyone made sure to let me know that if I needed any help, just ask. Early in the rehearsal process, I felt an immediate closeness among the cast even though we were still getting to know each other. We became such a family even down to the little disagreements we would have. It was funny how one show could bring strangers so close together to form bonds that last a lifetime. There is a reason that I found New Line and Scott at this point in my life. And I think that the reason is very simple. It was time for me to grow up and realize who I am and who I am becoming. I know that might sound strange, but working with this company, in these two shows, through the allowance of Scott, I will never be the same again. Thank you, Scott! As with every family in the 1960s, our lives were changed by the Vietnam War. What was once a typical family of kids going to high school, school plays, and sports had turned into a life of impending doom. My two older brothers were drafted into the army. Our home was filled with quiet fear of the dreaded phone call that they were “going over.” No one really talked about it until the letters from their friends who were there were sent. Here I was, a little girl, listening to stories of shrapnel imbedded in the arms, legs, and faces of the boys I’ve known all my life. I tried to escape from the nightmare of what was happening around me. But how could I? Dan Rather, war correspondent, was showing me images every night on the news of bloody bodies, stories of torture, POWs, and the horrors of “the real world.” I felt utterly confused, helpless, and totally freaked out that my brothers may be included in the body count of the dead. Children should not believe that war is a part of life. I thought every generation had to have a war. After all, my grandfather was in WWI and my dad in WWII. Doing Hair helped me break out and shout to the world to stop the violence, stop the prejudice. Hair gave me hope of peace and the realization that I can make a difference. I finally can speak out and express the emotions that I kept inside of me, so tormented, at the age of twelve. I am a new person because of Hair. The Osage Tribe has a motto to “Keep It Real.” If we speak out about the injustices of the world, someone will listen. The audience listened, and I felt empowered and it has overflowed into my life and I will never be the same. My brothers, Pat and Dan, never were shipped over. By some miracle of fate, they were saved and I am thankful. 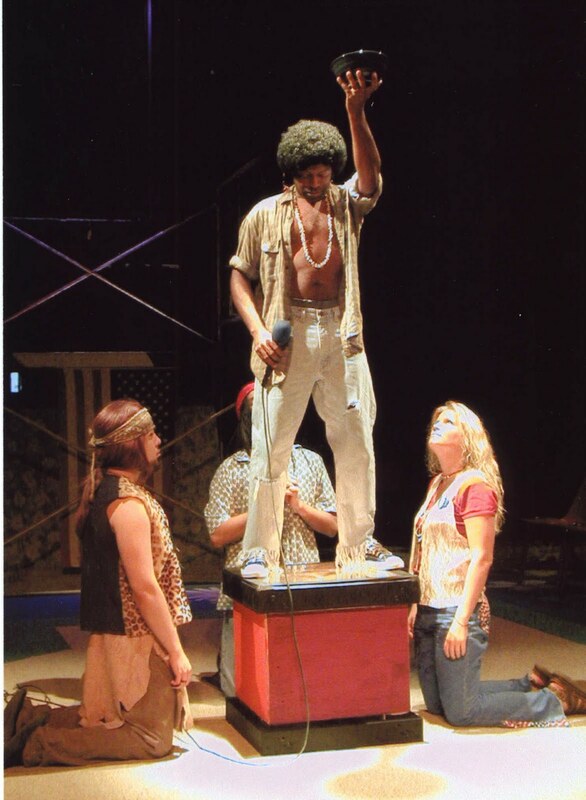 It’s impossible to describe the experience of performing Hair to someone who hasn’t done it. I was highly skeptical of the many people who told me their lives were changed by working on this show – until I worked on it, that is. From the choosing of the tribe name to the overwhelming, almost unbearable rush of emotion in the show’s finale, it is an experience unlike any other. 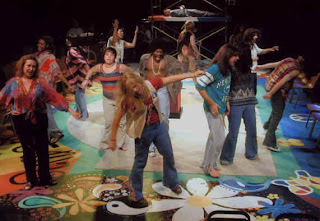 Not only does it bond each member of the tribe to every other member (and this includes actors, director, designers, musicians, box office people), but it bonds each tribe to all the other tribes around the world, past and present. It centers people, changes them, guides them toward balance in their lives, guides them back to paths in their lives they’ve forgotten or abandoned, guides them toward a deeper spirituality, one that may or may not have to do with Christianity. Even the most cynical among us was transformed by Hair. It holds a mystical, primal power that is impossible to explain. Just as it is utterly unique in so many concrete ways, it is just as unique in all the unexplainable ways. And because we closed this second production of the show just nine days before the infamous terrorist attacks on the World Trade Center towers and the Pentagon, it shaped profoundly how we reacted to that event as well. We talked a lot about that among the tribe. We felt like we all had an additional shield against the attack on America, a shield the rest of the country didn’t know about – as Hallmarky as it may sound, we had the power and the peace of Hair to get us through that. Michael Butler, the original Broadway producer of Hair, had told me when he flew in to see our show that he believed another 60s era was coming and that the Hair tribes would lead the way. Certainly, when the U.S. declared war on September 11, we all saw parallels to Vietnam and we wondered how he knew. And what of LSD? Is it just a drug, or the reason a group of children grew flowers in their hair, had stars in the eyes, and thought they could change the world? If they knew then what they know now, would they still have tasted those sweetened drops, or would they have laid down in the transcendental river of reality and let it wash them away – daisies and all? What a crazy time that was. Whoo! But did we dig it then and do we dig it now? We do. And if I meet up with Scott Miller in St. Louis, I definitely will say thanks for letting me put the flowers back into my hair and keep the starlight in my eyes for two summers now. And I’ll probably let him know that I dig all of the time he spent researching those cats and their message, so we could stay true to their power. Boom boom, beep beep. And so maybe they really will change the world after all – just not as quickly as they had hoped because they didn’t foresee the need to hand the daisy-powered baton to the next generation. And so maybe the journey of these past two summers of love are not at the beginning or the end, but just another piece of that movement. And maybe when Scott and the rest of the tribe look in the mirror, they’ll notice the stars and they’ll keep on passing out flowers and won’t put them down for a long time to come. Our destination is the same – our journey is where it’s at and we all know where it’s at. Let the sun shine in. Peace and love. Yes, Hair changed my life. Now that I have that out of the way, I figure I’m faced with two choices. I could either: A) spend the rest of this essay attempting to articulate just how Hair has made me a more caring yet carefree person with an amazing renewed spirit, blah, blah, blah; or, B) I could describe a single incident that kinda sums up all of those things in a nice neat package. While A is a tempting, I think I’ll keep it simple for this assignment and go with the answer I always chose when I couldn’t come up with something better on high school history tests: B. Playing Claude in our production, I found that people had strange reactions to me after the show. Having just seen Claude murdered in the jungles of Vietnam, only to appear once more as a ghostly vision, some people were hesitant to talk to me. Some wouldn’t even make eye contact. But there were others still who only wanted to tell me about their personal Vietnam experiences – the political atmosphere in the late 60s and early 70s, the horrible memories of the draft, and the young people they lost to Vietnam. My mind went numb. Nothing I could’ve said would have made a difference anyway. It just sent a breaker of emotion that started at the base of my neck, up and over my head like a hood. I had no use for the headband any longer. The show was over and it was time to move on. I just thanked the woman for coming to the show, hugged her and zombied upstairs to the dressing rooms. As I stripped out of my character’s final soldier’s dress uniform and began putting on my “real world” clothes of jeans, tennis shoes and a t-shirt, it smacked me hard. 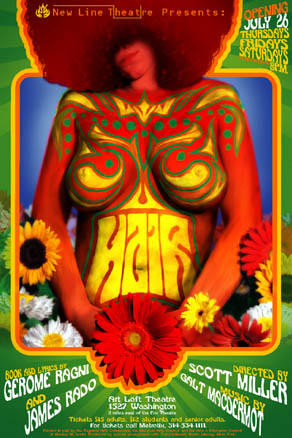 The idea that Hair wasn’t just some relic of 60s flower power. Its effects have reached way beyond that. This show that seems so dated on the exterior, but it’s still having a profound effect on every member of its audience and anyone involved in its production. This woman’s simple request broke through my opaque walls and the sun came piercing through. Taking stock, re-prioritizing, and connecting with people in ways I had long forgotten – it’s all in my future now. I’m following the river in my heart. Down to the gutter. Up to the glitter. Into the city where the truth lies. Thank you Hair. Thank you God. And thank you to the nameless woman who showed me the way.